I've been using this stroller for a few month now and really enjoy walking/hiking with it. It is so well designed that it could be pushed with one finger, and it goes over bumps in the road and switches from pavement to dirt or grass seamlessly without waking up my baby. 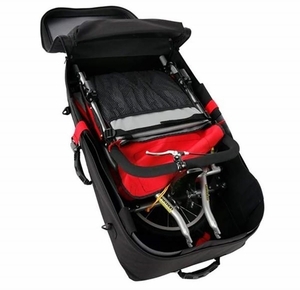 The under stroller storage compartment isn't huge, but it is a decent size and fits everything I need. I didn't want to pay for a BOB cup holder, but love the $15 pouch/cup holder by Skip Hop that I attached to the handle bars - It holds 2 drinks, keys, cell phone, etc. and keeps everything I need within reach. It is a longer stroller, but it easily fits in my SUV, and I could see it fitting in a car as well since the front wheel rotates. I'm so glad I purchased this stroller, and was very happy to see it on sale (since I believe the color was being discontinued, plus there was a holiday sale). Albee Baby shipped and delivered it very quickly, and the whole process was seamless. Love this stroller! We live on a farm with dirt roads and bought this stroller for it's great suspension over the bumps. Grandma liked it so much she bought on for her house! We love our BOB stroller! Lots of room, easy to operate and ride smoothly. Great price from albee baby. 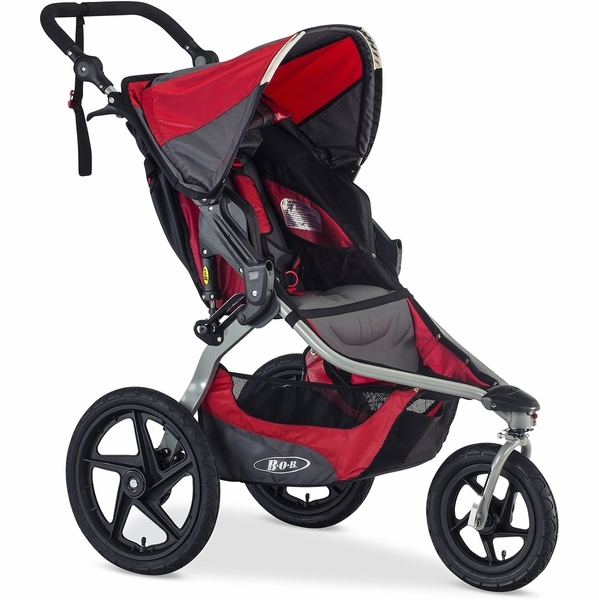 Got a great price on the bob revolution stroller and fast delivery. I love this so far. I went with the revolution flex over the lower model mainly because of the larger wheels, which I felt would be better for running. It's great, rolls well, and my 3 year old loves it and will fall asleep 5 minutes into my run. It also rolls well on grass so can walk around our property with it. I do have to be slightly catious, because it feels easier to tip when walking on hills due to the three wheels. It also folds up easily but is a bit clunky in the back of the car. The wheels can be removed for travel but it didn't have to take them off to fit in my wagon. I absolutely love this stroller. 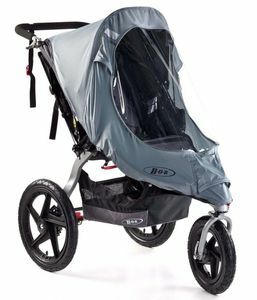 We had originally purchased a non-jogging stroller when our baby was born and it worked fine but wanted something we could take on more rugged terrain and jog with. This stroller is worth the money and we actually wished we would have just purchased this from the beginning to use as an everyday stroller also. It is kind of big when it is folded down so putting it in my trunk can be tricky but it still fits with room to spare. I could see if you have a smaller car that it might not fit great. Overall very happy with the purchase and recommend to everyone. This is my 3rd child so I'm super picky with gear! I bought this as a second stroller, I'm not a jogger but my every day Vista stroller jiggles if we off road ;)I could see the difference as soon as I unpacked the wheels! Huge and super solid. 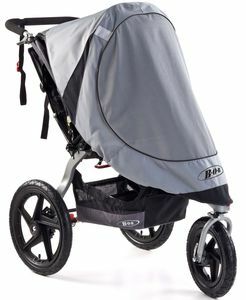 This a really well made stroller, has a higher weight capacity than any other and I can tell you it doesnt jiggle my baby ever!I don't use it daily as its heavy, but I can go on walks anywhere and jts Super smooth!Also took it on a 5k and immediately saw why people choose BOB for running, it handled AMAZING, and made our run/walk SO easy!Highly recommend! We purchased a new single BOB after our older one was getting worn out. We use our BOBs (both single and double) all the time, for both running and also anytime we head to places like playgrounds or amusement parks. The seat is large and roomy and fit my four year old. 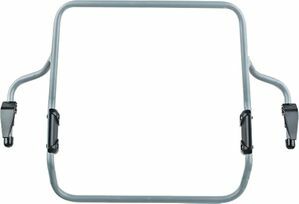 The sunshade provides significantly more coverage than a standard stroller. I can't say enough positive things about our BOBs! A little heavy and big, love the shocks on it and pushing is easy. Basket below is a decent size. Just had to buy all of the accessories, but that is with anything. Love it!!! 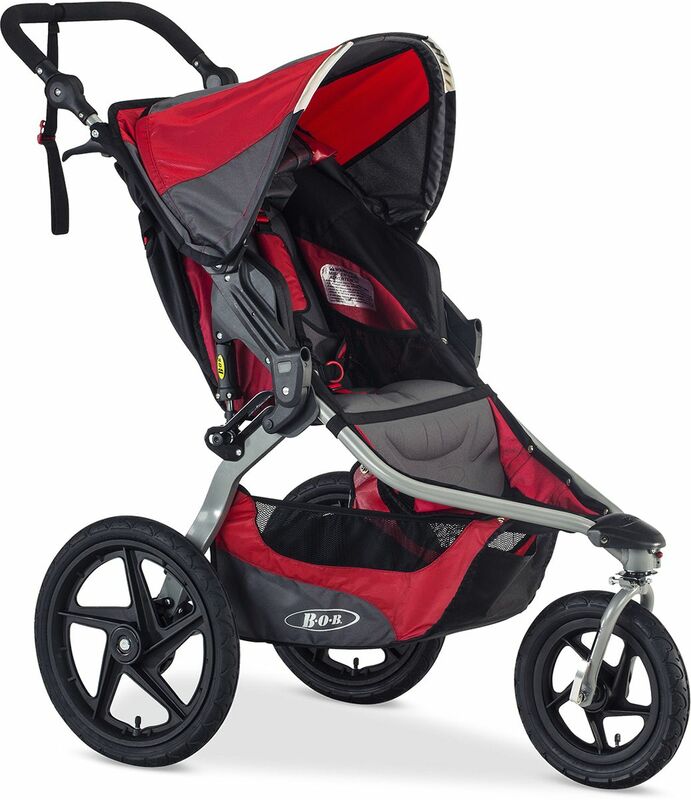 Great price at Albee Baby's AND truly the Lexus of baby strollers! We've used this for the last 3 months now. Previously, we thought baby just hated outdoors. But ever since we started using this stroller, he's either quiet and watching everything around him or simply falls asleep while in it. We've even walked to the grocery store and placed a few shopping bags below the stroller on the way back home and are able to hang a fully loaded diaper bag at the back. It meets all our needs and does so really well! I'm so happy I bought this one. I researched jogging strollers for 6 months. I had all winter to look, and I read a million reviews and articles. Its awesome! And so simple to put together the wheels come on and off with ease. Excellent stroller for great price! We were thrilled to find this stroller for significantly less than other retailers! It shipped very quickly and arrived in great shape! ProsIt is easy to roll, easy to fold, roomy and sturdy! I absolutely love this stroller. The price was amazing as well. Very smooth and comfortable! Love the high weight limit. 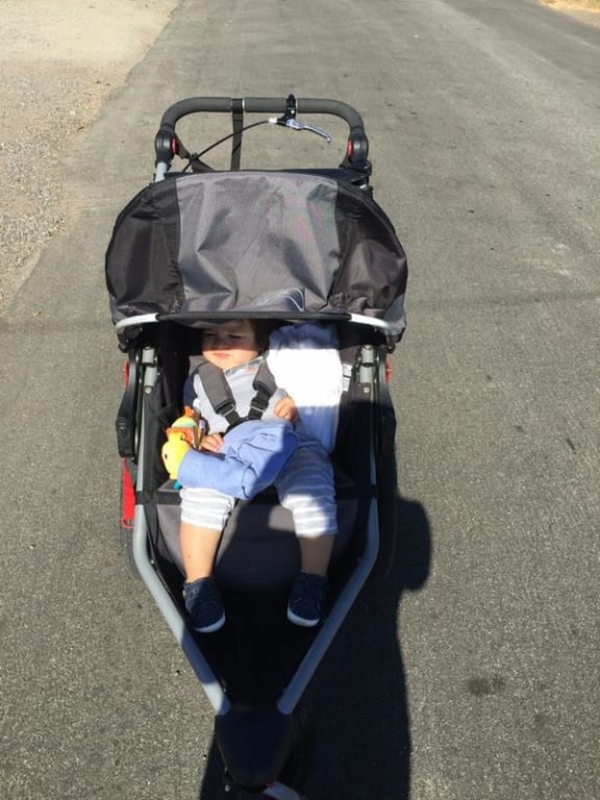 our favorite stroller for jogs or going to the beach. Easy to fold! We love our BOB. 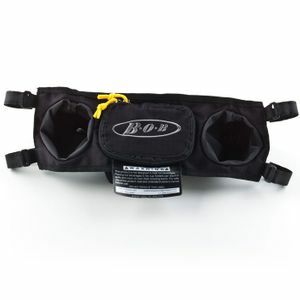 We purchased this BOB Revolution to replace a previous generation model that we used for six years with our first child. We loved our old one and our new model is also great. 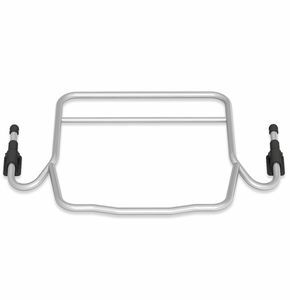 We use the chicco car seat adapter and works like a charm. 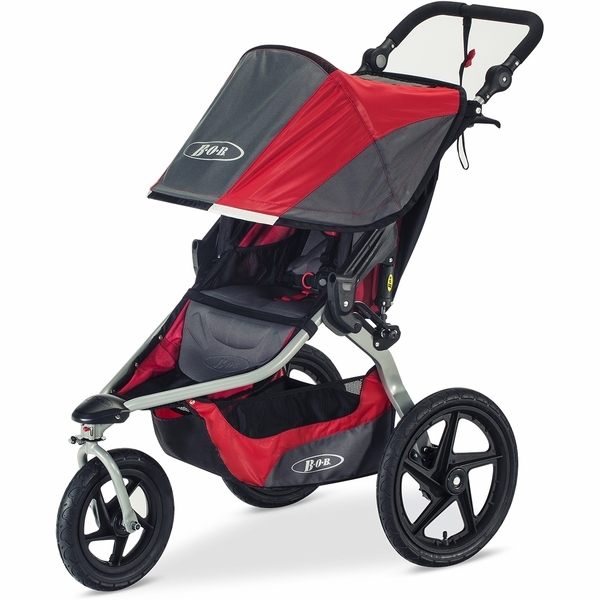 This stroller works well for running, walking on uneven/bumpy sidewalks, playground sand, trails, etc. 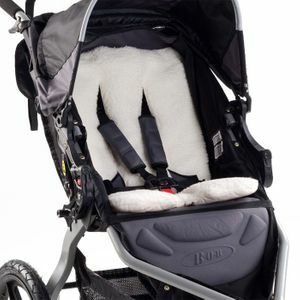 It's an all around awesome stroller and the shocks make it a very comfortable ride for baby. The only thing that I would do differently if I had it to do over is I would buy the one with a hand brake. We now live in a very hilly area and the hand brake would be helpful on any stroller. We don't have it for long, but we hesitated in purchasing it due to the size of the weels. On the other hand, when it arrived we were very satisfied. 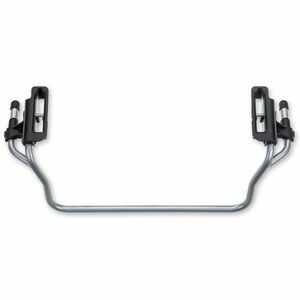 The wheels come out easily and no problems at all assembling or disassembling it. We love the red color. Our little girl looks very thrilled and enjoying her rides. Thanks Britax group for making such a nice jogger. ProsSmooth ride and the wheels can be easily disassembled for transportation . ConsRelative heavier than other joggers, but it is worth it. I'm really pleased I finally bought one of these. 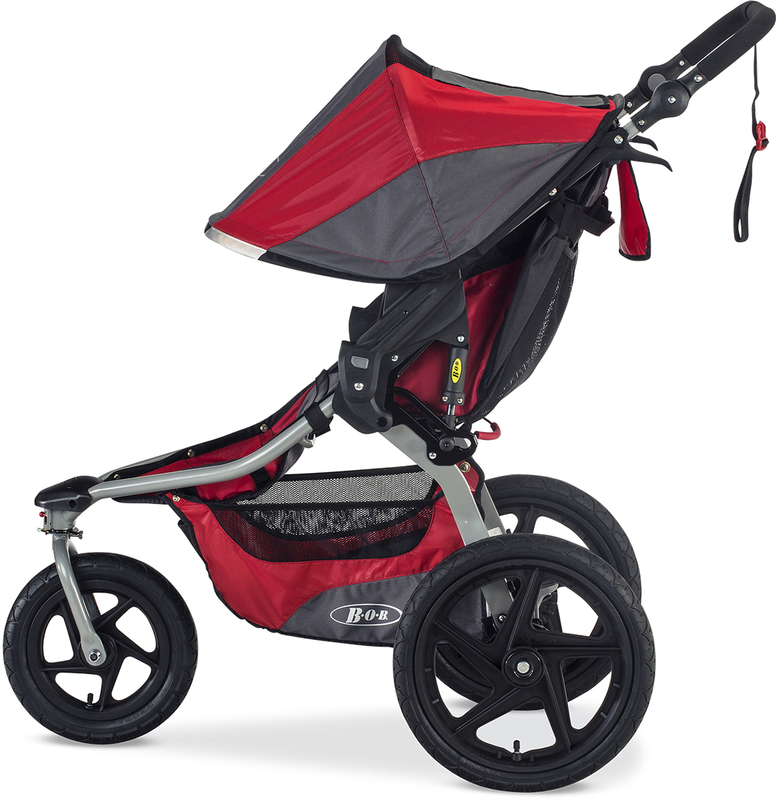 The stroller was easy to put together and has been great to use when we know we'll be encountering unpaved areas. I love that the seat sits upright too (great for a curious toddler that isn't a fan of reclining). It's easy to push and I find the fold fairly easy too. I do wish it automatically locked once it is folded, but not enough to wish I had gotten the one that does. I would definitely recommend it! This stroller is great! Easy to put together, fast shipping and my daughter LOVES it. I get an extra 30 mins to an hour in it then my other ones. I can now train for my marathon without getting interrupted by any uncomfortableness. We just bought this stroller and I had such high expectations because ALL my friends own it. My son is 41" tall and 49lbs, so I needed something that had higher maximum limitations. I didn't realize the canopy would literally rub his head when he supposedly had 3 more inches. BOB please take a look at the Schwinn Turismo design. There is an additional 8" of headroom above the top of the seat before your head hits the canopy. Sadly, this Jogger only goes to a max. of 50lbs though. Truly debating whether or not to keep this stroller because it is such a smooth ride though. We love this stroller for its all-terrain capability and high weight capacity. You can push it across a cobblestone street or across a grassy field. Great suspension system. It's also great for pavement, too and pushes like a dream. We have a 4-door sedan and it's a bit cumbersome for me to lift it in/out of the trunk 'hole' for day to day errands, but if we had a larger SUV style vehicle I think it would be easier. This stroller is extremely versatile. We've used it for shopping, Disney & off road at pumpkin patches, etc. I love the steering for running as well. It lays completely flat when little ones are tired. Perfect stroller in my opinion. ConsOnly con is its a very heavy stroller. My husband always ends up carrying it at Disney or in & out of the car. As another reviewer stated, the sun shade will not stay down. It will go down but immediately recoils. It's very disappointing because it doesn't provide the full coverage it should. We initially thought it would stay down with time,but it doesn't. I love the stroller otherwise, but this is a big "oops" in design and it shouldn't be for the price we paid. This stroller has been everything I thought it would be. 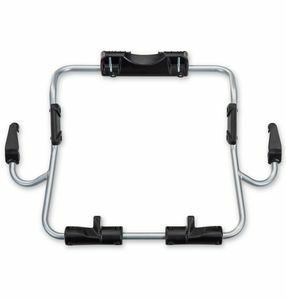 I was struggling with pain in my wrist after pushing our old stroller while walking......this stroller has changed the game. I have had no pain since using it :) Also the little one enjoys the ride. This is my third BOB stroller. First was a 2010 revolution, second was a 2012 revolution duallie and now this one. I have to say the quality of the construction has diminished greatly from the 2012 version. My biggest complaint is that the canopy won't stay down, which is incredibly frustrating. Second the rear wheels on this are no longer the quick release lever type. 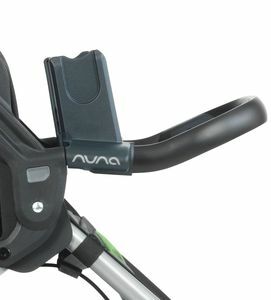 The new style quick release feels inferior to the old style. Also had a squeak in the suspension after only the third or fourth use. I like many of the non structural functions, but the construction is certainly inferior to earlier models. I cannot lift it into my van because it hurts my back. Only recommended if you never have to lift it with a bad back. I too love my stroller and don't know what I would do if I didn't have it to get me out of the house most days for a workout with my first baby. I have recently noticed that the front tire makes a troubling noise that sounds like it might break loose out of the frame. I don't think it will, but the noise has prevent my little one from sleeping like he used to because it is so noisy! Do o need to tighten something? Take it to a bike shop? Dononhabe a lemon? Any advice would be appreciated. I was so excited to receive my BOB Flex. However, I am so disappointed and wish I would have spent my $300+ on a different stroller all together. 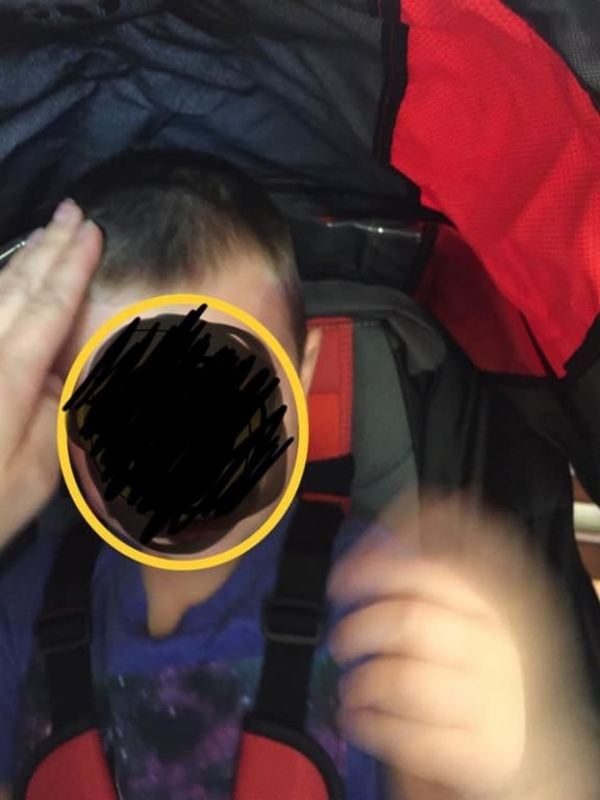 I have had the stroller for a little over a year and the tires are not holding air (they are not worn, they do not have any punctures in them). Furthermore, I purchased the BOB tire pump. It is worthless! It does not fit in between the tire spools of the stroller, therefore it will not inflate the tires. One of the biggest wastes of money. I would not recommend this stroller to ANYONE. LOVE this stroller but living in AZ means lots of sunshine and the canopy won't stay all the way down. It is constantly snapping back to mid-position. 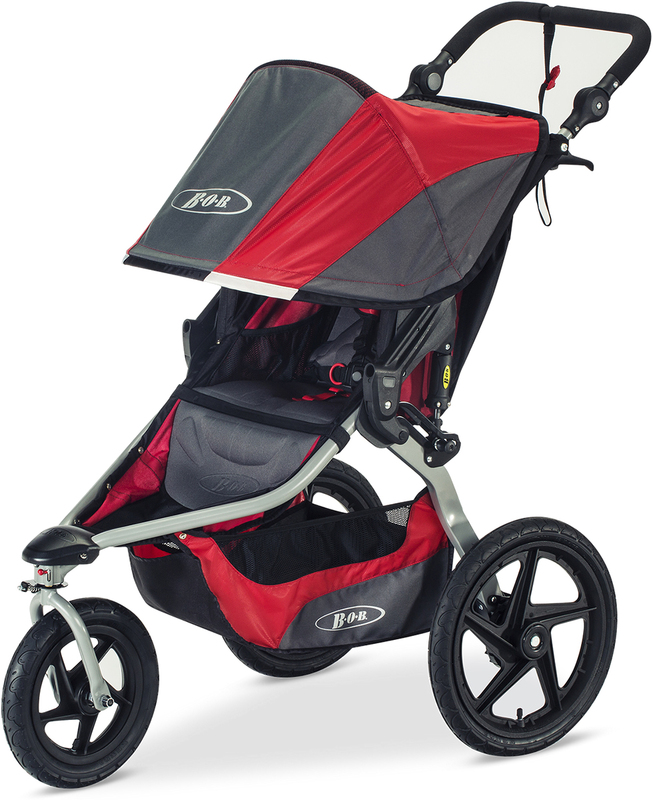 Great mobility for jogs, but shade won't stay down! 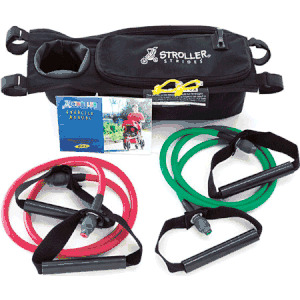 I was so excited to get this and started using it when my daughter turned 5 months during my first half marathon training. I am 6 feet tall and the handle bar height is perfect. She sits comfortable, but the sun kills her because the top canopy shade won't stay down! It extends fully and pops back up. I would return if I could because I have to run early in the morning due to our work schedules and the sun is always an issue during the last couple of miles. Bummed!! 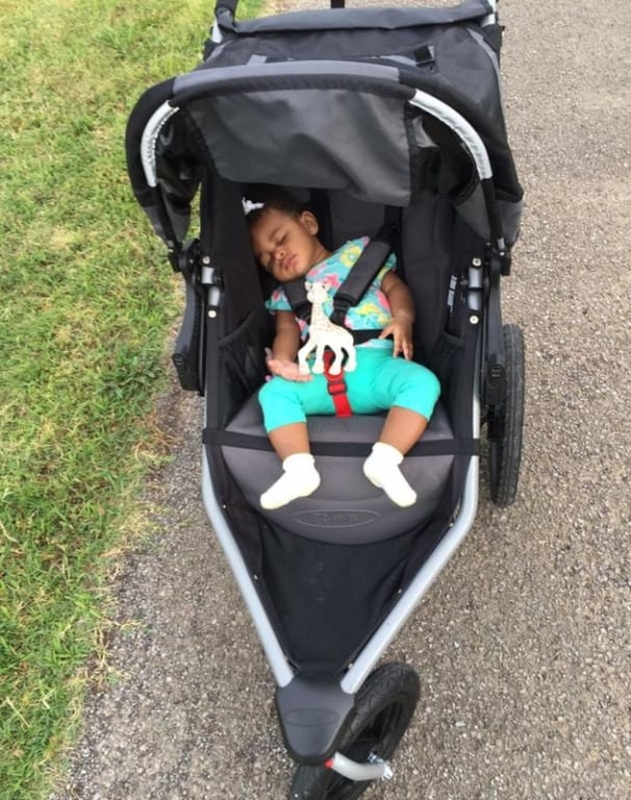 I have been using this stroller on a weekly basis to jog with my little one. 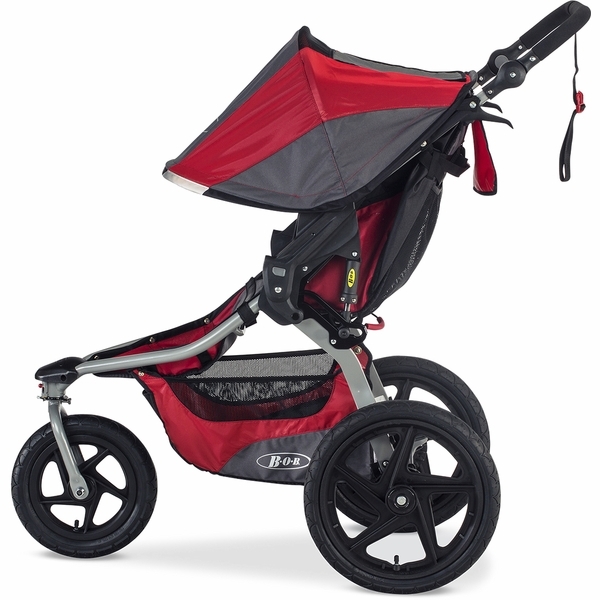 I am amazed at how easy it is to jog while pushing this stroller, it's virtually effortless. My little loves being in it and usually falls asleep. Great investment!